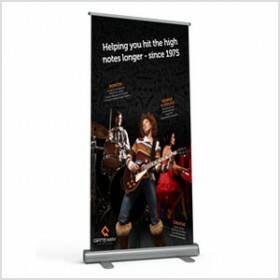 Banners are a great solution when you need a display that is easy to setup and convenient for travel. They are invaluable for sales conferences, seminars, and even make eye-catching boardroom displays. Display banners can be used in many different configurations. A single stand alone display piece can be used to showcase a product, or you can group multiple banners to create a unique backdrop for tradeshow applications. Customize your banner with lighting options, or perhaps choose an exchangeable graphic cassette, for quick artwork changes to your roll-up display. Our display professionals can help you select the right type of banner that will suit your needs and your budget. With so many choices it’s easy to make an impactful statement with a difference!